The flow rate depends on the heat transfer fluid. To learn more about types of liquid solar collectors, their sizing, maintenance, and other issues, see solar water heating. You can use a radiant floor, hot water baseboards or radiators, or a central forced-air system to distribute the solar heat. In a radiant floor system, solar-heated liquid circulates through pipes embedded in a thin concrete slab floor, which then radiates heat to the room. 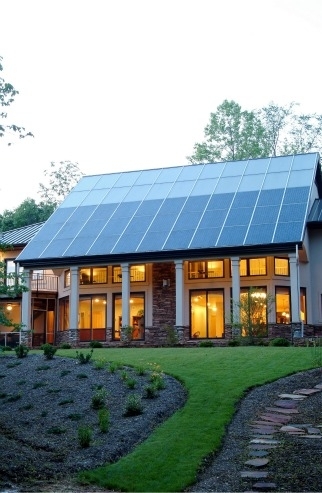 Radiant floor heating is ideal for liquid solar systems because it performs well at relatively low temperatures. A carefully designed system may not need a separate heat storage tank, although most systems include them for temperature control. A conventional boiler or even a standard domestic water heater can supply back-up heat. The slab is typically finished with tile. Radiant slab systems take longer to heat the home from a “cold start” than other types of heat distribution systems. Once they are operating, however, they provide a consistent level of heat. Carpeting and rugs will reduce the system’s effectiveness. See radiant heating for more information.